Waste Water - Water Tech, Inc.
Water Tech was founded in 1990 to provide integrated waste water treatment solutions for the food processing industry. Our ability to independently evaluate complex waste water challenges and provide effective combinations of chemical, mechanical, or biological solutions is the back bone of our success. Our experienced technicians will customize a solution for the challenges posed in treating industrial process and wastewater streams, which are as varied as the industries themselves. We provide solutions for customers in multiple industries including poultry and beef processing, food processing, paper mills, manufacturing, mining, power utilities and municipalities. If a solution requires bio-augmentation Water Tech will provide specifically selected bacteria (microbes) for a wastewater treatment system to enhance the system performance in some fashion. Typical systems include once-thru lagoons or aerated tanks, activated sludge plants, sequencing batch reactors, and rotating biological contactors. Our product line includes multiple blends of carbonaceous (organic degrading) bacteria and options to enhance biological nitrification (ammonia removal). Our solutions are focused on reducing the total cost of operations for our customers, as a result we can provide options to handle the complex nature of sludge production to minimize volume and improve dewatering characteristics. 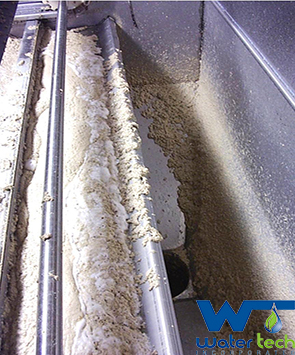 Water Tech can provide coagulants and flocculants for wastewater applications with GRAS specifications as appropriate for the food industry. Our product line is diverse to handle any application and we have the unique ability to provide proprietary blending to accommodate any special need. Complete product line of bio-augmentation options are available for industrial and municipal applications. Our full-time equipment team can provide everything from feed and control equipment to large capital equipment for any waste water application.